Starting April 21, we will be expanding our use of mobile-friendliness as a ranking signal. This change will affect mobile searches in all languages worldwide and will have a significant impact in our search results. Consequently, users will find it easier to get relevant, high quality search results that are optimized for their devices. Just like any big changes there will be winners and there will be losers. In fact 90% of websites on the Internet are going to be in serious trouble as their websites plummet down the search rankings, and it is about to get a whole lot worse. You need to save your Google rankings as soon as possible before it is too late. Why Has Google Made This Decision? Statistics show that mobile Internet use is overtaking traditional desktop use for many activities. Google understands the exponential growth of mobile usage and as a result, it has changed how they rank and display sites. The update will now negatively impact search results for any website that isn’t considered mobile-friendly. 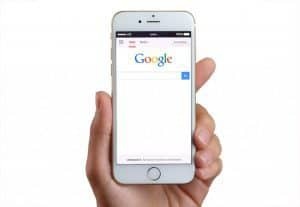 If you have a website and you rely on potential customers finding you in Google search results then you really need to make your site mobile-friendly as soon as possible. The longer you delay it, the sooner your competitors with mobile optimised sites will outrank you. Potential customers will purchase from them instead of you. What Does having a ‘mobile-friendly website’ mean? When you first created your website you most likely imagined your visitors viewing it on a large desktop or laptop screen. It is more likely that they will be seeing your site on their mobile instead. Now here’s the problem. Take a look at your computer screen or laptop. It is probably bigger than 12” or so. Now imagine somebody is looking at your site on their smartphone. Mentally squish all of the content on your website on to a tiny smartphone screen. That is what your visitors will be seeing. If your site is not “Mobile-friendly”, the layout will be wrong and it will not be easy to read. Your visitors will have to pinch and zoom their way all round your site and it won’t be an enjoyable experience for them. Rather than persevere they will quickly leave your site and visit another website instead that has been optimised for their mobile making it easy for them to find the information that they are looking for. Considering all the work you’ve probably done over the years to drive traffic to your website, it would be devastating for you to lose it all due to technical issues. How Do You Know If Your Site IS Mobile Friendly? It is extremely simple to use. All you need to do is enter the URL of your website, click the blue ‘analyse’ button and the tool will be able to tell you if your website is mobile friendly or you need to make improvements. What Can I Do If My Site Is NOT Mobile Friendly? If your site is not optimised for mobile then it really is going to need the upgrades. There are a few different ways to get your website mobile friendly. Responsive web design uses different style sheets to reformat how your website displays across multiple devices. The actual website content and the HTML coding will remain the same across mobile devices, but it will be possible to rearrange, hide or display specific content depending on the screen size. Adaptive design is clever as it can detect a specific device (smartphone, tablet etc.) and dynamically serves users different versions of the website which are tied to particular devices. Just like responsive design, it still uses a single URL across all of the devices. Standalone mobile websites have unique URL’s. These exist as a completely separate website from the desktop version. There are pros and cons to each method of developing and creating a mobile-friendly website. Responsive is currently Google’s preferred method and it is the easiest to update and maintain. However, while it can transform your web design to display well on mobile devices, it won’t transform the content to fit your mobile users needs. Google has made its stance on mobile very clear. You no longer have the luxury of contemplating whether or not you should invest in or upgrade to a mobile friendly site. If you want your site to do well and be found in the search engines, it is essential. Don’t panic. We know it can seem daunting, especially if you are concerned about your website disappearing from the search engine rankings. This is your livelihood and you could potentially lose a lot of money and sales so we are at hand to work as quickly and efficiently as we can to get your website mobile and Google friendly. We can optimize your existing website to look good on any and every Smartphone and mobile device. You can be assured that our mobile-optimized websites work on all major phones and tablets. We can enhance your mobile site using plugins, which are various tools designed to add greater functionality to your mobile website. We follow this up with detailed user analytics so you see how your website performs each month. You can be certain that your mobile website becomes an essential part of your on-line presence. Don’t wait for your site to be penalized by Google. Act today. Remember, your competitors will be in the same situation, or they may even be having their website optimized right now, so you need to move fast to prevent any loss of sales. We are here ready to take your call. Don’t put it off another day. Contact us now. 239Web is a web design and marketing agency serving Southwest Florida and national businesses. Ready for a change? Our Fort Myers team can help with all your web needs, including website design, SEO, Facebook lead generation, and overall look on the Internet. Request a quote today.